Sen. Amy Klobuchar called on the White House Tuesday to submit new nominees for a federal court opening after fellow Democratic Sen. Al Franken announced he’d oppose President Donald Trump’s choice, a state Supreme Court justice. Trump nominated Minnesota Supreme Court Justice David Stras in May for the 8th U.S. Circuit Court of Appeals, which covers Minnesota, North Dakota, South Dakota, Iowa, Nebraska, Missouri and Arkansas. But Stras got a lukewarm reception from Klobuchar and Franken, who spent months reviewing the pending appointment amid outcry from conservatives that they were blocking his appointment. Franken said Tuesday he’d oppose it, citing his worry that Stras’ background and writings would make the court more conservative. His input is an important but arcane part of Senate procedure for judicial nominees: Senators typically get to sign off appointees from their home states before those candidates progress for confirmation. “I have grown concerned that, if confirmed to the federal bench, Justice Stras would be a deeply conservative jurist in the mold of Supreme Court Justices Clarence Thomas and Antonin Scalia, justices who the nominee himself has identified as role models,” Franken said in a statement. 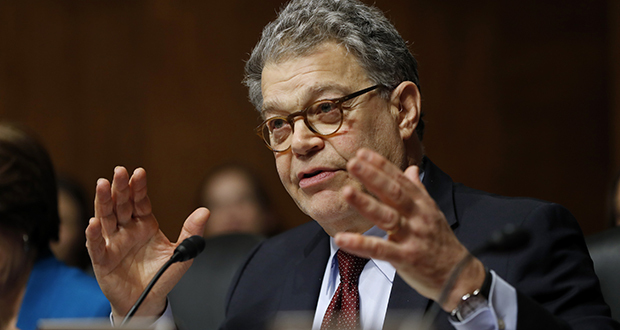 Franken’s opposition doesn’t necessarily block the nomination. Several judicial nominees were eventually confirmed in 2004 despite moving ahead without the blessing of their home state senators. But Klobuchar said that Stras should remain on state’s highest court and the White House should put forward more nominees for the federal position. She released a statement minutes after the announcement by Franken that said she personally believed Stras should get a hearing but urged Senate Republican leadership to heed Franken’s opposition. Stras declined to comment through a Minnesota Supreme Court spokesman. A spokesman for Senate Judiciary Committee Chairman Chuck Grassley did not immediately respond to a request for comment on whether Republicans would proceed with the nomination.